Tonight, I prepared myself for ritual. I cleansed myself with frankincense incense smoke and patchouli oil. My clothes were changed and my robe donned. Quickly, I filled my black mug with water and I thought of the true blessing that clean water is. I made my way outside and found a spot where the moonlight could reflect in the water of my mug. The dark contents shone like a mirror and I invoked the Goddess of the Moon. Hecate was called upon to join me and I thanked her for her presence. Guidance and wisdom were both asked for, I drank in the blessed water – I drank in the silvery moonlight. Thanks were given and I poured what I did not drink on the ground at my feet on the little grass left in our winter. Inside, I ate a piece of chocolate and grounded my energy. Then I ventured out to take photographs. The image was taken with our Samsung camera, not my usual cellphone. 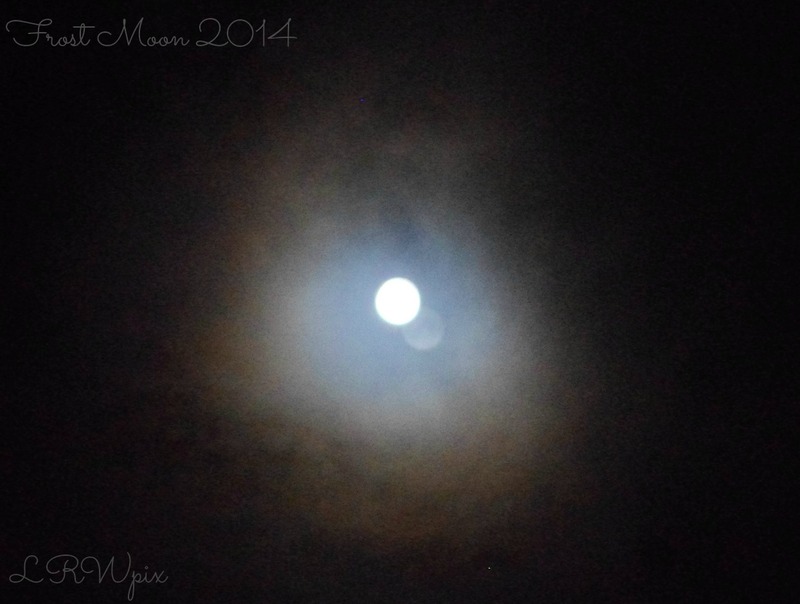 I was delighted that the evidence of the double image of the moon came out so clear, it is absolutely enchanting! 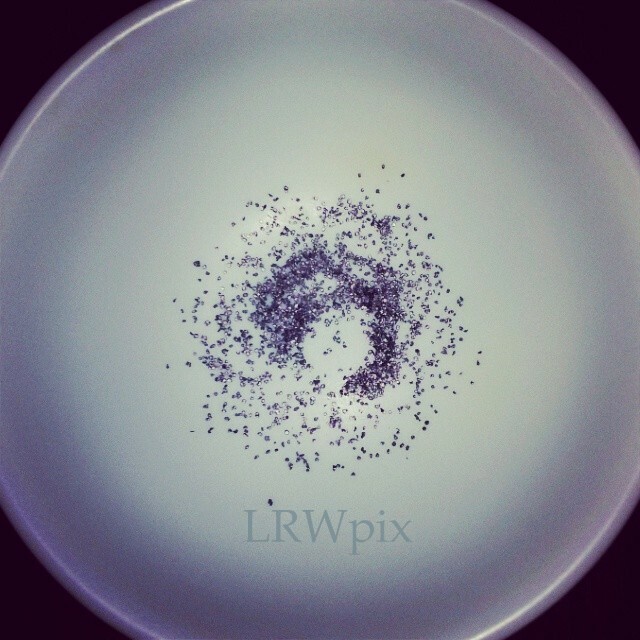 On September 24, 2014 we entered a new moon. In the course of my studies I have learned that during a new moon it is a great time for banishing rituals/spells as well as “planting seeds” of positivity and desires/goals we wish to achieve. I recommend studying further into these ideas on your own as I am not especially versed in these areas in order to teach. In the photo pictured above you see three mussel shells. I chose 3, for it’s magickal properties. The shells are actually from a recent dinner, I cleaned and saved them for this purpose. I actually had a total of 9 but used 3 for this ritual. 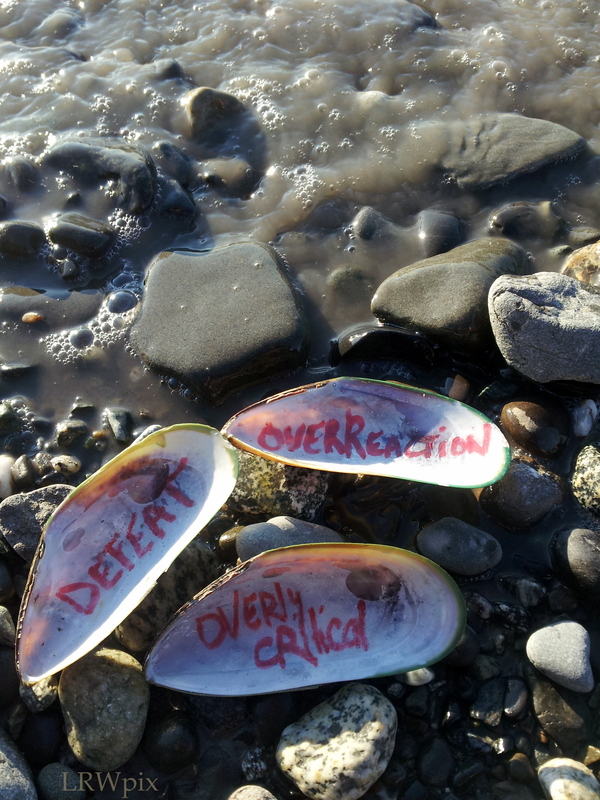 My 3 mussel shells on the beach before I let them go in the current. On the beach, right at the exact spot I chose there was a Fireweed flower floating in the water. I did not notice the flower or place it there, my best friend and fiance actually pointed it out to me. I take this as a wonderful sign. 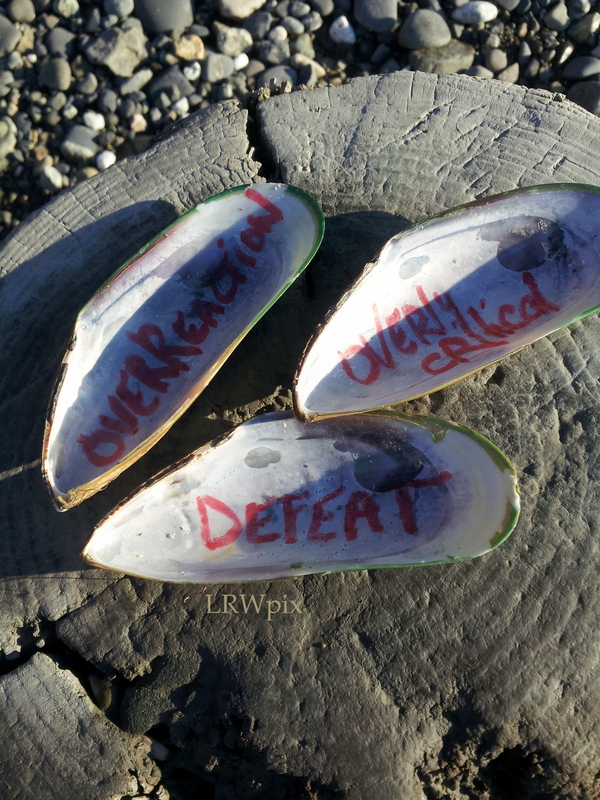 During the moments before tossing the shells back into the ocean, I reflected on the three things I wrote on the shells. It was actually kind of difficult for me to allow the “overly critical” shell to be shown in the photo. Or, to actually be used in the ritual because I was fairly unhappy with my writing of the letter “T” in critical. A great reason to just let it go! That which no longer serves me I RELEASE! 2 of the shells immediately went away very quickly in the tide. 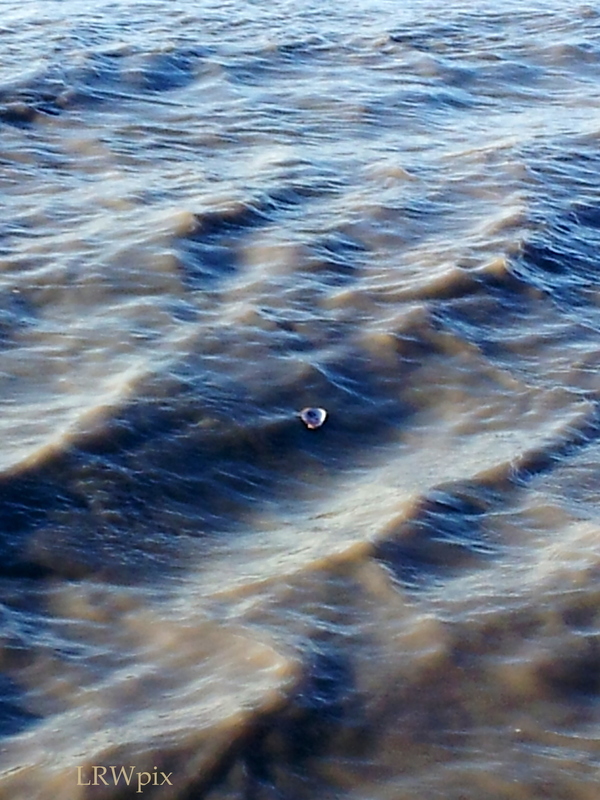 One shell floated on the water and close the beach. I ran along beside it, afraid it would actually come to shore. I had planned to throw it back out further if necessary, it was not. I feel like once I was finally ready to let it go, that is the moment when it went under the waves and out with the tide! Goodbye to what no longer serves me! Goodbye! 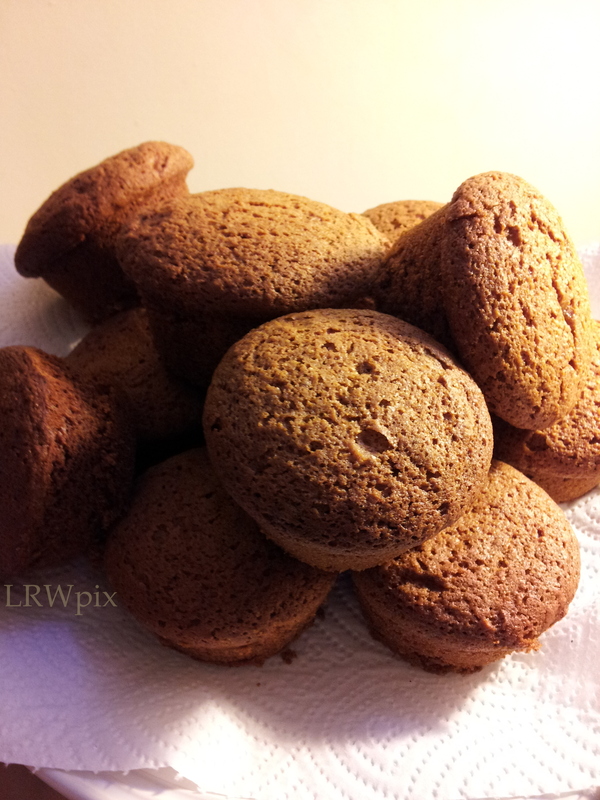 August 13, 2014 I made these honey cake muffins in honor of Hekate’s Feast. I walked through the woods and invited Hekate to join me, and I thanked her for her gifts. 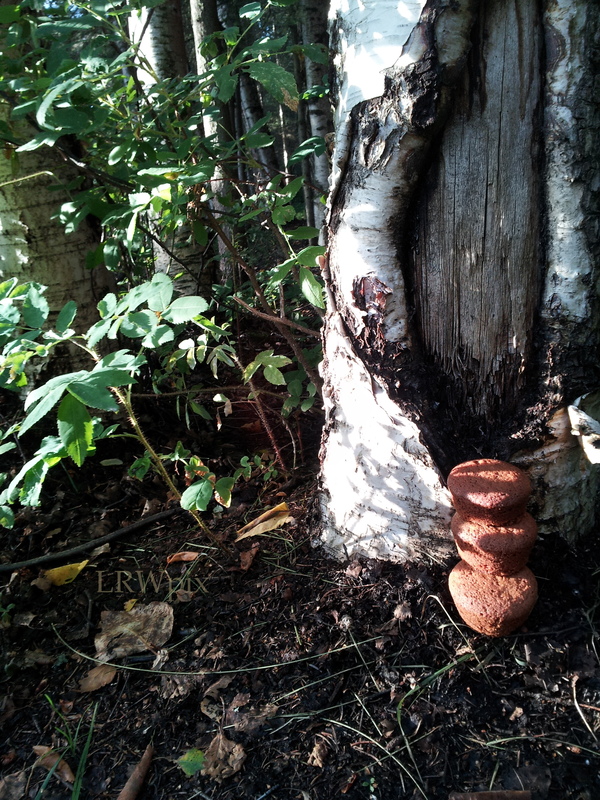 The honey cakes were left at the base of a tree with a fairy door in front. An offering to the goddess and to the other side which we might not see. It’s not the best photo. 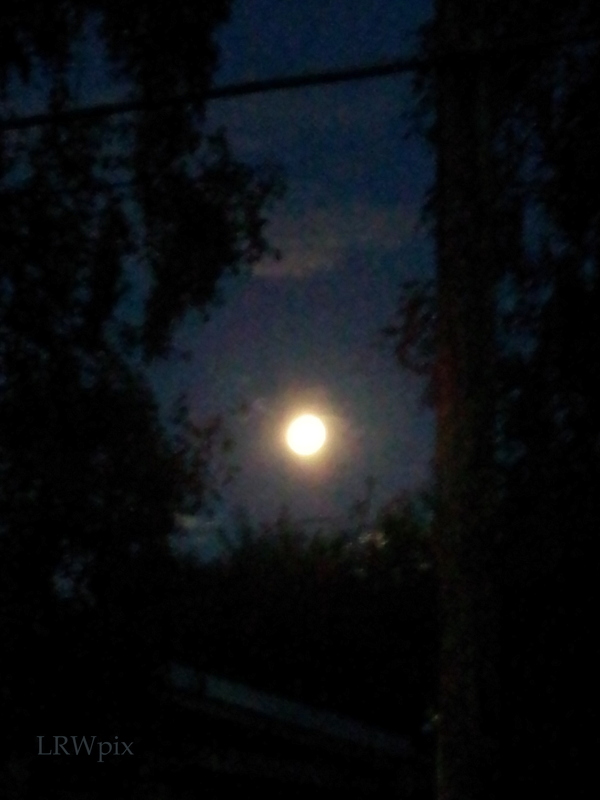 The moon itself was absolutely amazing, so large-so bright – it shone like a beacon in the sky! I was incredibly happy to see the moon as the night before there was serious cloud cover and sometimes it’s just not dark enough to see celestial occurrences in Alaska. May of 2014 was a particularly rough month for me. With many various concerns, I felt I was in need of general blessings. I read the info on a spell at one of my favorite sources. 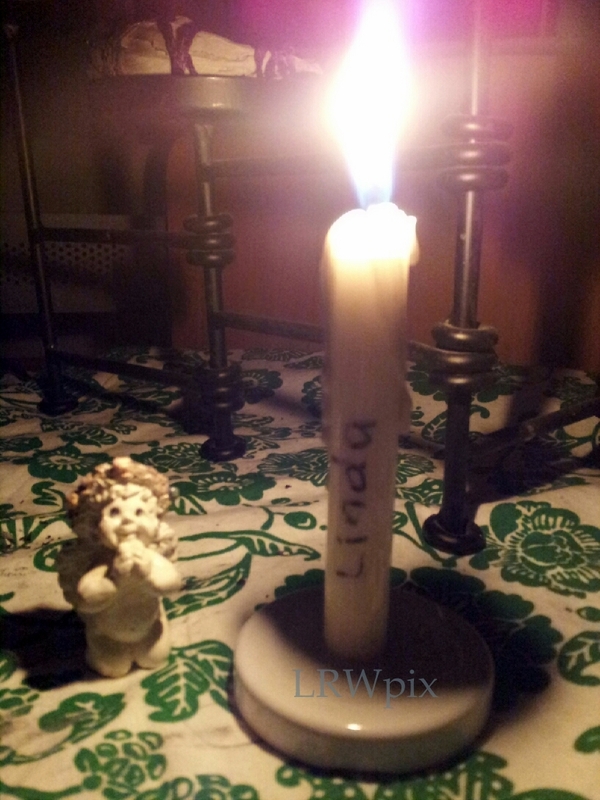 The spell actually calls for the name to be carved into the candle but I decided to just write my name instead (lazy.) I also made my oil to bless & anoint the candle with. I melted a bit of the candle and affixed it to the base which is a re-purposed lid from a small jar. Underneath the lid, a bit of my hair. I burned a bit of the candle everyday, pinching the flame between my fingertips. I said the blessing just as written on the site. The only modification I did make to the latter of the spell was that I said the prayer/blessing twice a day, I felt I was much in need. For me, this spell was very effective. I noticed a change fairly quickly and was happy with the results. Yarrow grows right along the sidewalks of my neighborhood but I’ve been saving a day to find clean places to harvest. The weather was perfect for it today. I was very picky while harvesting because much of the flower heads of the Yarrow I came across had the eggs from what’s known as the “spit bug” underneath. I also took photographs of many of the flowers and plants I came across. My harvest walk was fairly long and somewhat unproductive. When I got home with my crop, I used some of the info found on another blog (link) to get the herb ready for drying and use. The whole process has been fun and rather relaxing. 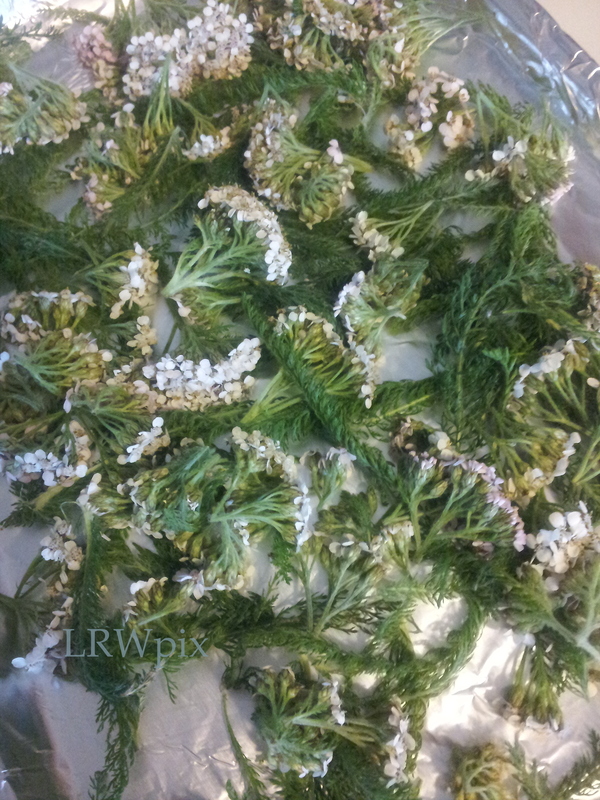 Yarrow flower heads and leaves. I had a small bowl when I was done. I tasted one of the fern like leaves while processing, it was very bitter and slightly sour. A few tiny bugs escaped while I was cleaning the heads and leaves from the stalks. 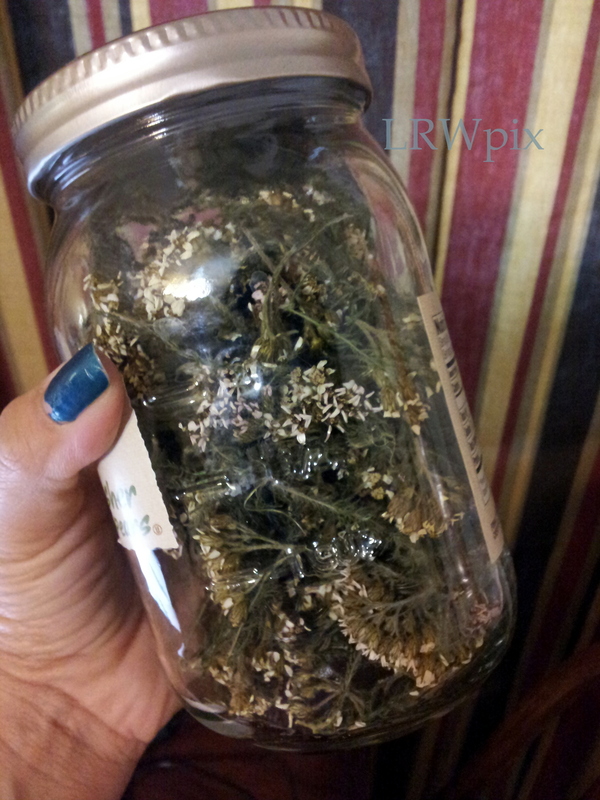 The dried yarrow in clean re-purposed jar. 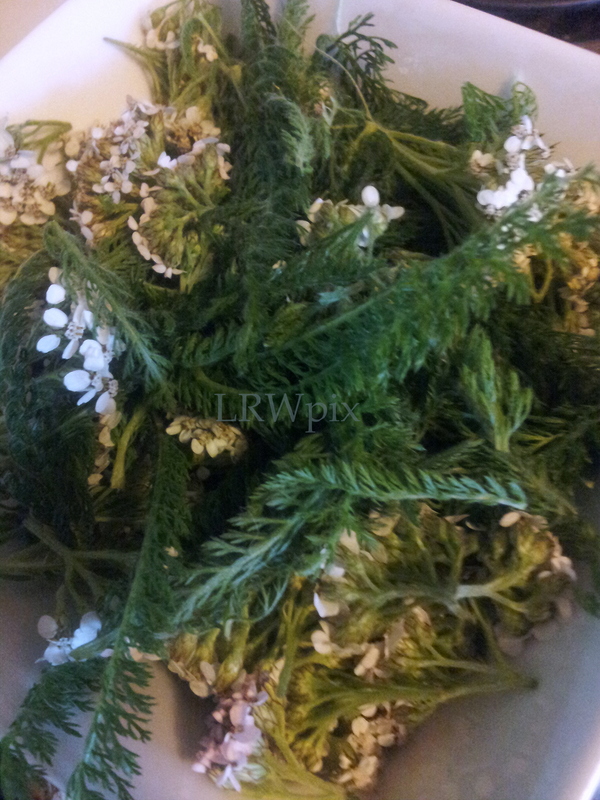 I was feeling rather poorly and realized yarrow to be a terrific detoxifier of the blood and organs. Water was boiled and I crushed the dried herb into a mug with a cone filter inside and I steeped the tea and added a dropper of milk thistle extract. I sipped it, my tea didn’t have much flavor outside of warm water but that’s OK. While sleeping I did notice my body temperature rise and my skin was warm to touch, I felt hot. I feel the dried yarrow was doing what it was supposed to by increasing my body temperature/circulation of blood and opening my pores. Next time, I think I will boil the herb in the pot of water for about 10 minutes and strain the tea into my mug. I have a bad neighbor. My neighbor has been testing my patience something fierce. I lived in a fairly quiet apartment building until she moved in, since then it’s up all night ruckus filled with illegal drug use and drunkenness. I will spare you any further details. I had recently read up on hot foot powder and decided with the new moon (a good time for banishing spells) falling on June 27th, 2014 it would be a great time to try it out. I originally thought the new moon would occur over the weekend and I realized I wouldn’t be able to acquire a missing ingredient – High John the Conqueror’s root, a friend recommended I graveyard dirt (which I have on hand) in it‘s place. When I mixed the hot foot powder I discovered I also was missing black mustard seed (heavy sigh) so my guy provided me with gun powder and I went heavy on the peppers. I got kind of excited while mixing the powder’s ingredients with my intentions and forgot to take a photo of the final product which I poured into her footie sock. I also wrote a message to my “enemy” in red ink on a piece of paper with my wishes, the paper was included into the sock with the powder. I didn’t have her name, so a substitute was used in the message. I employed a few different uses of the hot foot powder. I put inside her sock (even though I wouldn’t be able to get her to put it back on.) I walked backwards from the outside of our building sprinkling along her path and over her doorstep/welcome mat (skipping everyone else’s) and I tossed the sock over my left shoulder into the toilet (running water) and flushed. I realize I made quite a few improvisations and substitutes, however it was a first effort and good experience. **Update** Since performing this trick, my neighbor has not moved however I have noticed an increase of agitation and troublesome activity from her unit – it’s got to be only a matter of time. I also noticed her door mat has been pushed to the other side of the hall and that’s where it remains. 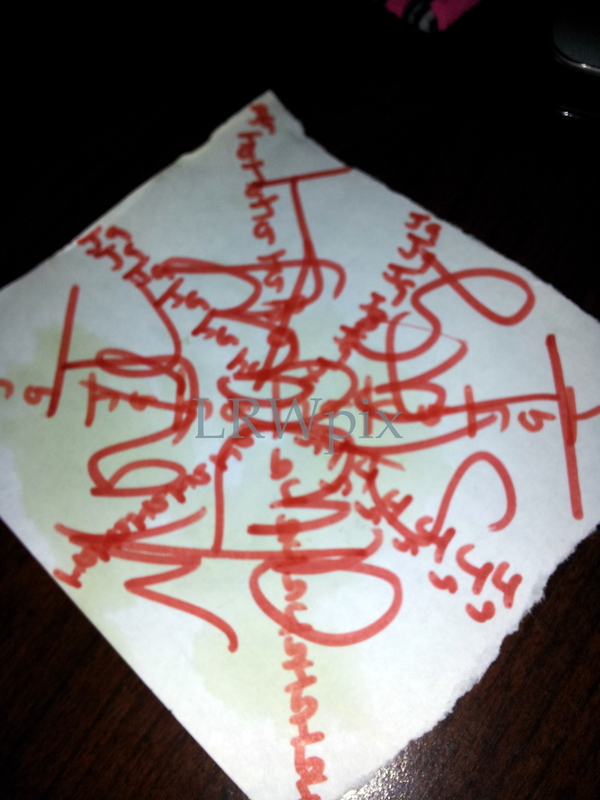 ***Update*** July 4th, 2014 she returned to her apartment. Apparently, it had been quiet for a few days after the last big scene and she took off and didn’t return home until the holiday. She couldn’t get in her own apartment, someone must have let her into the building itself. For over twenty minutes she knocked, pounded, stomped and wailed to get into her apartment; finally someone let her in. She has not left the apartment since. Her welcome mat was put back in it’s place (not by me) but quickly found it’s way pushed away from the door again somehow. ****Update**** July 16, 2014, much has happened in the past two weeks. Including her door being busted into, two inches of wood now missing from her door as they were not able to enter. She has become drawn to our energy I believe and new actions must and have been taken. *****Update*****August 6, 2014, my neighbor was evicted from the apartment. She is no longer in my building.